basketball heaven, a photo by thehutch on Flickr. Its playoff season and the time where he Celtics have historically shown their ability to play good ball. The last 5years have been great but as the team ramps up for a final run with the current big 3 – it is a long shot for a banner. However, we have counted them out before and every fan knows that they will give everything. 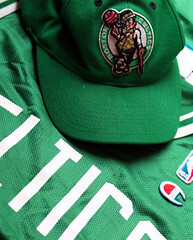 That is why the Boston Celtics are my team – Go Celtics!